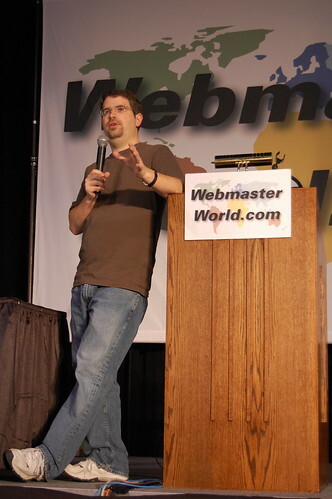 One of the most interesting moments at Webmaster World was the endorsement of WordPress by none other than Google’s Matt Cutts. For those who may not know, Matt has become the wonderfully laid-back and articulate “voice” of Google at Webmaster World. (photo by Andy Beal used under Creative Commons license.) As detailed in the video interview linked below, Cutts unexpectedly told the PubCon audience that by designing and producing a website in WordPress you, in essence, make it defacto search engine friendly. Especially with the latest version 2.3. I was very pleased to hear this because I’ve recently upgraded my golf blog, TheJoyofGolfing.com to WordPress 2.3; and then in the same week, ComBridges has also recently taken over site updates for a client who has a more static page (non-blog) website that was already produced in WordPress. Our company is also currently using it to add an integrated blog to a pre-existing design. These are options that, frankly, I didn’t realize existed with a “blogging” platform previously. Bottom line, I have become increasingly impressed with the WordPress website publishing platform. In addition to a well-thoughtout and feature rich back-end interface, there are options for everything from Google AdSense to static pages that make it more than just a blogging tool. And the real capper is the excellent array of third-party plug-in tools which have been written for the open source WordPress platform. 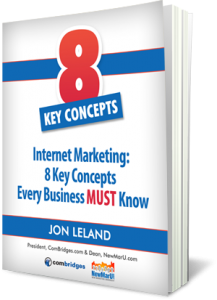 For example, as a search engine marketer, I was thrilled to find out about the “all-in-one seo” plug-in for search engine optimization. I’ve gotta believe that WordPress is now the state-of-the-art website publishing platform. Personally, I feel empowered by its features, stability and extensibility. And then today, I got word that Yahoo has written a very impressive plug-in of their own which helps website and blog authors to almost extemporaneously add links and pictures. Yahoo’s is kind of a “smart” plug-in that has the capability to suggest links as well as pictures (via Yahoo-owned, Flickr). Click here to watch a video demo of the Yahoo Shortcuts for WordPress. Below, you will find that interview with Matt Cutts. It includes similar comments about WordPress’ search engine friendly “nature” as well as other sage search marketing advise. Note, this endorsement is particularly interesting (as one commenter to this video points out) given that Google owns a competing blog platform (which I am using here), Blogger. Note, as mentioned, WordPress can also do “flat” pages so it isn’t necessarily just a blogging platform. It’s really a website development platform or even a lightweight CMS (content management system) as well as a blogging platform, or some combination of the above, depending on your needs.